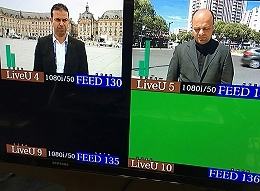 LiveU transmission units used at Euro 2016 by multiple broadcasters. Hackensack, N.J., July 2016: Major broadcasters around the world have once again taken advantage of the power and flexibility of LiveU’s technology to provide a 360 degree viewer experience of the UEFA Euro 2016 tournament. This includes both ITV Sport and beIN Sport, the latter via production company Medialuso, part of the Spanish Mediapro Group, who used units from across the company’s product portfolio to bring live images to their viewers from France. ITV Sport was the joint rights holders in the UK, along with the BBC, and split the live coverage of games with both covering the final. The broadcaster covered 51 games during the month-long competition around France from a studio in Paris. UEFA supplied 13 feeds from each game as the host broadcaster as well as around 30 crews also feeding back to the IBC in Paris. ITV Sport then had a crew following the England team, equipped with a LU500 portable transmission unit, and another crew that followed the other UK teams as well as the Republic of Ireland, also equipped with a LU500. The broadcaster also had unlimited LU-Smart smartphone licences using the LiveU GoPlan data plan package in case it needed them. Spanish production company Medialuso covered the whole event for beIN Sport with LiveU servers installed at beIN France and beIN HQ in Doha. Medialuso used 22 LiveU units from across the company’s portfolio, bringing together a huge range of coverage from all the French cities that hosted games and were the main headquarters of national teams. On average, they produced over 70 live feeds per day and for the final game they used 16 LiveU units sending feeds in parallel. Three of these were from motorcycles following the national teams of France and Portugal and also the match officials. The ITV Sport deal was overseen by LiveU’s UK partner Garland Partners Ltd. while Park 7 Tecnología in Spain worked with Medialuso.